We have just had some new literature through from Nucleus Commercial Finance regarding their Business Cash Advance product, BCA. We have previously documented their BCA offering, but below are the key details once again. 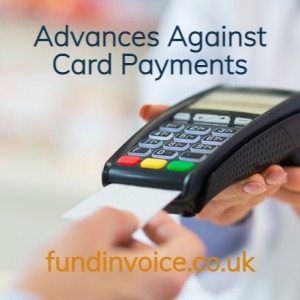 The card payment advance is available to companies that take payments via a card machine. You can borrow up to 120% of your total monthly card payments, up to a maximum of £150,000. There is no application fee and the product is unsecured. You have to have some trading history, which is explained in my previous post about Business Cash Advance. The clever part of this facility is that it is only repaid as a percentage of your monthly car payments. That means that if you have a bad trading month, and your card payment receipts are down, you pay proportionately less. This means that this type of finance remains affordable, even if you have a bad month’s trading, or a quiet period. It is quick and simple to set up this kind of facility, and cash can be made available to you within a few days. It does not affect your personal credit situation, and there is no fee for you to apply. Please call Sean on 03330 113622 for help, or you can apply to Nucleus Commercial Finance via our contact form.